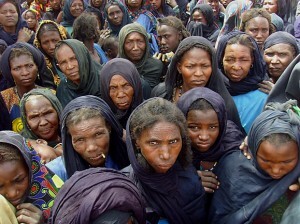 Have you seen much news media coverage about the crisis in the Sahel? I haven’t. Not much at all, actually. The first I heard of the Sahel food and refugee crisis ravaging Africa’s Sahel region was in a tweet. 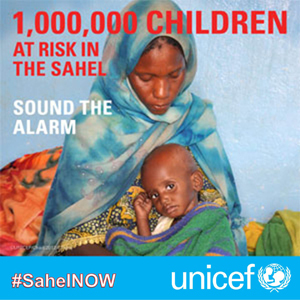 There has actually been a lot of social media coverage on what’s happening thanks to an UNICEF campaign, #SahelNOW that swept Facebook and Twitter. After doing a bit of research on why I haven’t seen much in the news media and have in social media I got to thinking about how refugee situations are actually covered in the news media versus social media. At first I thought, maybe I just hadn’t caught the Sahel headlines at my regular go-to news websites. I investigated first by Google searching about the crisis and then by searching some of the major news sites. Surprisingly, almost all of the first two pages of the Google search were reports from international aid organizations’ websites or news agencies reporting on UN reports of the crisis. After searching major news sites, I was surprised how little coverage there was. Only those news sites that were foreign based or nontraditional online news sources (Al Jazeera English, Huffington Post, BBC News, Reuters) had both recent and ongoing news stories of the crisis situation, whereas national news sites (The New York Times, ABC News, MSNBC) had maybe a story or two. This says a lot about news media coverage of crisis and refugee situations that seems to be ongoing. US news outlets overall just don’t provide continuous coverage of refugee situations. Sadly I’m not surprised, but I am concerned. I’ll admit that I get why they don’t or can’t. Refugee crises often occur in remote regions where news outlets may not have staff and ongoing (sometimes for decades) crises are not events that constantly demands headlines. But, it is dangerous to forget that a crisis, like what is happening in the Sahel, is happening right now. People stuck in these situations are already vulnerable, but to be forgotten by the rest of the world only makes their situation worse. This is where social media has stepped in. Social media generates a lot of interest, especially worldwide; and can effectively put the issue “on the map.” Isn’t this where we’re getting most of our news information anyways (or at least the shift is going this way)? Social media has taken on the role as the newest form of education and awareness-raising on refugee and other humanitarian crises. The #SahelNOW campaign was obviously trying to do this and they did so by mimicking the same tactics that lead to the widespread initial success of Kony 2012. But, was it successful or did it suffer the same fate as Kony 2012? Is it another example of slacktivism? I would have to say yes on all accounts. UNICEF data shows that the campaign was successful in getting the refugee crisis noticed and mentioned rapidly throughout social media sites (in part thanks, no doubt, to those always useful celeb endorsements from Selena Gomez and Shakira) and even brought the issue to traditional media agencies, like CNN. However, their data also shows that when they weren’t running a huge media push for the campaign, interest dwindled. So, it appears we do have another case of slacktivism by definition. Is this good or is this bad? Personally I think organizations like UNICEF need to learn the lessons from the Kony 2012 campaign and innovate based off what worked and what didn’t to maintain active interest. Social media has so much potential to raise awareness on issues like refugee crises, it’s just a matter of how to harness and sustain this awareness. I don’t want to sound like I have the answers, because I don’t. But, it will be interesting to see what the next campaign will be and what strategies whoever they are will come up with. Will it be more of the same or will we see the next wave in social media awareness?